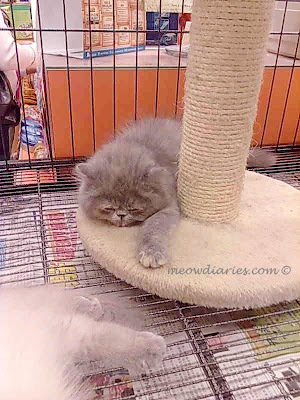 B took some lovely shots of two fluffy new kitties at the Pet Store when he bought cat food recently. I adore kittens and since I did not tag along, B snapped these pics for me. Is he trying to entice me to get a new kitty with these adorable pics or what? 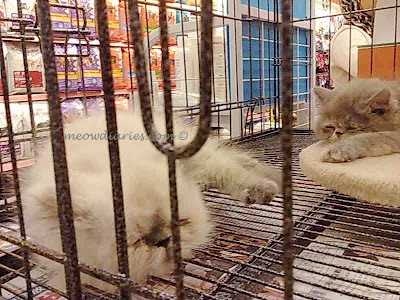 Come to Master fluffy white and grey kitties! Enticing me it seems Shemah oh no! Hahahahaah I am known for impulsive buys ni LOL! their own garden. Have you seen the houses at south quay?? wooot!! I want! thank you marzie!! :) memang dah lama tak chop here, right?? they surely do! my daughter even asked me to get one. But i'm afraid what my dogs can do. Safe for them inside the house but a no no..
Good to hear that Elai, congrats on welcoming a new cutie pie soon!! HUGS! Wah so early u went out Mon? I woke up early today woo hoo! is cheaper? coz it's smaller ...is it? U went out for makan2 Mon? I am hungry thinking abt food that’s why I’m asking hahaha! Hahaha finally!! I went to my room and fell asleep immediately, B was still inside my office doing work lol! Fur Ballzz! :):) Poor little guys just sleeping and waiting for a new master to come along and rescue them...in the meantime...sleeping away like Garfield! Cheers! :) and Happy Friday! Wah so fluffy!! i like!! KFC nasi lemak? nice meh??? Not to say fresh as a daisy la but feel better than yest…so tired and sleepy, wan to walk oso no energy ha ha!! Ha ha ha so cute la muG cake for dessert….sick and tired of mug cake edi actually haha, I’m thinking I wan to cook NL for B… hopefully can get ingredients. Sometimes hard to find daun pandan..
aiyo so kesian lah walk oso no energy! lol!! LOL! ok no mug cake! hmm u mean nasi lemak? Hahah tu la funny la me complaining to B abt being tired and cannot walk yest hahaha! shop....yeah fluffy type and small! very very cute..
wah so pandai lah u can make nasi lemak oso! Hahahahahaha must wake up early to try KFC brekkie set…or maybe B will buy for me while I zzzz hahaha! lol then B didn't ask u go and zzzz kah? So cute la R wan to buy puppy immediately! If he buys puppy, then u have to jaga the puppy while R works hohoho! LOL sure la can make nasi lemak! Easy only..u can try cooking for R one day, surprise him! hahahah dat's why i said NO. i dont even dare to touch how to jaga! U scared if u touch, it will bite u is it Mon? Cause that’s how I feel lol! Small and cute oso I scared mah… he he..I mean I won go near la, just admire from far hohohoho!! hahah not a surprise, but a shock!! no Mariuca! i feel very geli like dat hahahhaha!! yalor me oso just admire from far! wnat to touch but scared how lah.. I won touch la, too scaredy-cat to touch…no way! Hohoho…nemind no need to buy doggie all tell R, might as well save the $$ for ur pink Christmas laptop LOL!! Snake?? Oh no!!! I think fish je la ok for ur situasi Shemah lol! Maybe u can cook something really simple like fried rice!! i wanna try cook but he always says no need lah! I dropped for meows and MPG edi, now dropping for WOAFS! Then I will reply comments.. :) Dropped all my cards at TUO edi too yay! LOL he says only no need but deep down inside sure he wants to taste ur cooking hahahah, shy2 cat it seems R! meow! eh last Sun i saw one Sony pink laptop! sweet!!! Wahhhhhh Sony good or not for lappy? I’ve never used a Sony! hahaha aiyo no need to shy2 cat lah R! Ha ha ha ha ha…sure R will LOL if he sees this conversasi abt him here! yeah according to him Toshiba is the best in terms of durability! i'm oso quite happy with my lappy but not happy with the color hahhahahah!!! Nice colour will inspire me…so yup must choose the best colour! lah. haven't had to send in for service yet.